I like the hollow points. Good performance in my Ruger 10/22. Outstanding from Lucky Gunner, as usual. I ordered this CCI .22 ammunition early afternoon and it arrived FedEx the next day. ( I live locally near LG). My Grandson (age 11) and I went to the range that afternoon, and he burned up all five hundred rounds in his brand new .22 Mossberg Plinkster 702. I purchased four (4) ea. Mossberg 25 round 702 Plinkster magazines for him...so as he was firing, I was loading the magazines. Yes...you have to teach your Grandson not to unload a magazine at the range while he is fantasizing that he is Rambo. After a few hundred rounds of waste...we dialed in the weapons adjustable sight. This weapon has no scope. He (once he calmed down after burning through those hundreds of rounds) , with the help of Grandpa teaching him how to do it...was finally able to get groups at 2 to 3 inches 100 yards down range. They were slow coming...understand that there were 20 to 30 second "waits" between shots...but if an 11 year can do this with iron sights...I imagine those with good eyes and experience can drill these CCI rounds. Excellent ammunition....oh...no misfires, jams, ftf or any problem at all with the ammunition. It all fired and left the barrel. I have never, nor do I expect, any bad service from Lucky Gunner. Once, a product broke down in performance (not LG's fault) and once notified LG corrected it immediately. Superior service and really good kind people to be a customer of. Thanks for all that you do. This was the first time using the Mini Mag in my new SW 22 and forgot how they operate a semi auto with authority and accuracy. The great customer support from Lucky goes without question. Always great performance with CCI Mini-Mags in my Buck Mark pistol and rifle. This is one round that's consistently reliable, which in .22 is rather wonderful. Very fast delivery, packaged very well, accurate ammo. Lucky Gunner shows you all the information you need to know about each product. Their videos are also very informative. 22 LR - 36 Grain CPHP - CCI Mini-Mag doesn't seems to like my Ruger sr22. Out of 200 rounds, about 10 jam and 2 misfire. 22 LR - 36 Grain HP - Winchester feeds better with my sr22 and seems to be cleaner. Have ordered numerous times from Luckygunner, always have ammo 2 days after ordering ! Plus prices are quite competitive . Who said there is a .22 shortage !? Very please to see this item back in stock. Arrived well packaged. I think this is high quality ammo. Was not available locally for some time. I haven't had a chance to use the rounds yet but I know from past experiences that it's a good product. Also the service and shipping was great. Great ammo, fast delivery, excellent packaging. This is very high quality ammo. Good quality ammo. Super fast and accurate shipping. Great ammo very accurate in my Marlin model 60. Fast delivery, on sale, accurate, and clean. My marlin model 60 is picky but loves these rounds! Accurate and clean and on sale, what more could you ask for! JUST A LITTLE ON THE HIGH SIDE. AGAIN LIKE MY OTHER REVIEW THE PRICE IS HIGH BUT WHAT CAN YOU DO. I AMNOT GOING TO LEAD UP MY BARREL WITH CHEEP CRAP WHEN I CAN GET GOOD AMO. BUY WHAT U CAN AFFORD. Good deal. Great Round. Excellent Service. I am back to buy more of the same. This is the hard to find and unquestionably the BEST rimfire ammo manufactured. Once I saw it available at Lucky Gunner, I ordered it. As always with Lucky Gunner I received it in 3 days! Nicely done! My Sig would never fire a complete clip without my having to manually eject at least 3/4 fired rounds. No more problems, fired 100 rounds without a problem. Your service is amazing, ordered one day and got my ammo the next day. I have told six other people about your company and great service. You have nailed customer service, please keep it up. We have been using Remington 22LR ammo in the Ruger SR22 for about a year and have experienced at least once in every magazine load The second round fails to load. It was isolated to one of the magazines. The recovery was to cycle the slide to bring in the next round. The CCI rounds completely eliminated the problem. It could have been caused by not holding the gun solidly enough but the problem went away with the CCI 22LR (more power = reliable operation). Works good in both by Ruger Mark III's and my 10/22. I shoot semi auto 22LR's. The Ruger Mark III and 10/22 operate without jamming. The rounds seem to of good quality as I don't get the occasional dent in a casing that you commonly see with other manufactured rounds. The costs continue to be higher for 22LR regardless of the manufacturer. So far, I have been willing to pay this higher price. Glad I found luckygunner -- pleased with everything. There is no doubt that Lucky Gunner is my go to supplier for ammunition. great selection, availability and excellent service before and after the sale. What a great deal on a great round! Supurb service, Supurb Delivery, and Supurb ammo! Thanks Lucky Gunner! Great ammo. I own 10k rounds. I would buy more but can not justify the price. If i were low in 22 ammo i would make the purchase. After discovering Lucky Gunner on the web, I have been a happy camper. Fast service and the best prices on the web. I have finally found a company that can meet all of my ammunition. Shooting is expensive. Lucky Gunner makes purchasing ammo less painful. Great ammo functions well. Best of all is the high quality service and products. I have purchased several times from Lucky Gunner and could not be more pleased with the staff, products, and their fast shipping. 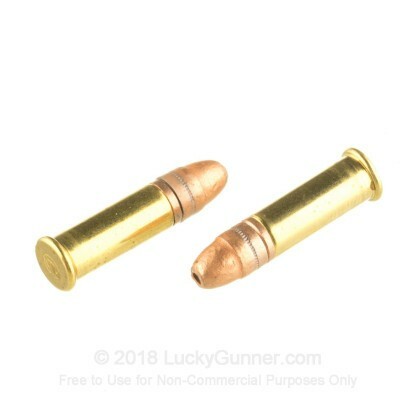 I have recommended Lucky Gunner to everyone when asked where I purchased my ammo. Thank you and keep up the great work. Great Ammo. Wish they would have it more often and the Stinger brand too. Five stars for availability! Yay bullets! Easy to navigate website. Flawless transaction. Quick shipping. Above & beyond customer service. I can't imagine having a better purchasing experience. Best ammo ever! A little pricey but worth it. These bullets work great, far better than other brands and Lucky Gunner shipped quickly with no problems. There is a reason Mini-Mags are so hard to find, it is great ammunition. It is the best performing ammo in all of my 22s, rifle and pistol alike, bar none. Granted I don't have an Olympic class target gun, but mine do well. I am glad to see that Lucky Gunner can get them fairly regularly at a fair, for these days, price. This ammo was great through a pair of Marlin semi auto rifles. The kids had a blast at the range and I only had to clean out 2 jams from the kids trying to make the guns sound auto. I think they went through 500 rounds in a little over 45 minutes. The task during this trip was to teach them how to load and fire and as you can imagine they got pretty good fast. I'll have to find some dirty ammo to slow them down and teach them to clean out misfires and jams. I guess it won't be CCI for that trip as these rounds were great! 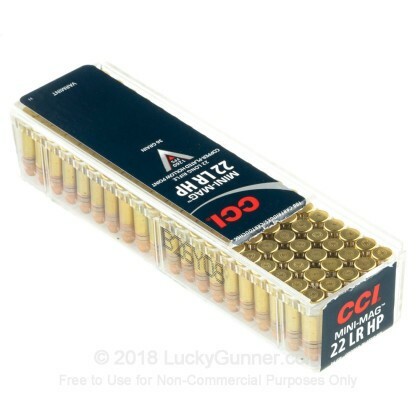 I order CCI whenever I can find it; both the Mini-mags and the higher velocity Stingers are superlative ammo that functions without flaws in my rifles & pistols. I'm very happy with the ammo, and the service Lucky Gunner has given me. was lucky to find lucky Gunner. they had the cci 22Lr. brand i like to use. wish they had stingers. Good product as usual shipping was a little slow for Luckygunner!! and Henry rifle and other single action revolvers. Fired every time for me, which is important cause 20 cents a round average for good pinging ammo needs to be reliable. As far as accuracy goes, it's not the bullet, it's me that can't shoot straight. I'll take Cci Mini-Mags any day over other more expensive .22's. CCI Mini-Mag burn clean and perform very well, even in a brand new firearm. Only had a few stovepipes in the first 10 rounds. After that, performance was flawless. Thanks Lucky Gunner for awesome service and fast delivery! I'm in Seattle and with gas what it is, I buy from Heidi and have money left over to throw in the range jar. This ammo works will in my Walther P22 and Henry Rifle. LuckyGunner's service is always as good as they claim it to be. I'll continue ordering from LuckyGunner again. Shoots better then lower cost options in My Ruger Mark lll. Clean and accurate. the only ammo that makes my old jc higgens semi auto work..
"Best 22rl Ammo on the market." Fired over 1000 rounds through a new S & W MP15-22.It loved it.Will buy more.THANK YOU LUCKY GUNNER FOR YOUR FAST SERVICE AND DELIVERY. I need to order several thousand more rounds. CCI ammo has always been top notch. No different from LuckyGunner. A great product at a very fair price. I put about 300 rounds through my new Sig 522 this last weekend. No problems at all. I need to buy a couple 1000 more rounds before California completely outlaws internet ammo purchases the end of this month. I've run a bunch of these through my old Marlin semi-auto rifle. Never misses a lick. Good price, good service. I've ordered from them before and will again. 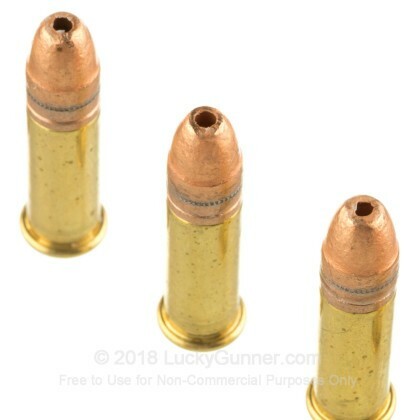 only ammo that will flawlessly function in my p22. super clean. A: Hello Dennis, CCI lists the velocity of this round as 1260 fps. Q: Will these work in my new Ruger 10/22 takedown? A: Hello Ernest, Yes, these 36gr. CPHP rounds by CCI in .22 LR will work in a Ruger 10/22 takedown. You shouldn't have any issues with them. 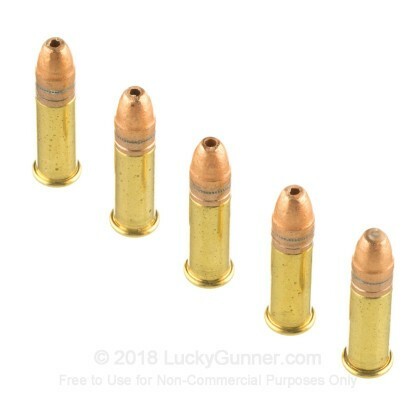 Q: Are these considered high velocity rounds? I have a Sig 1911 22LR that works best with high velocity rounds. A: Hello Jim, These 36gr. 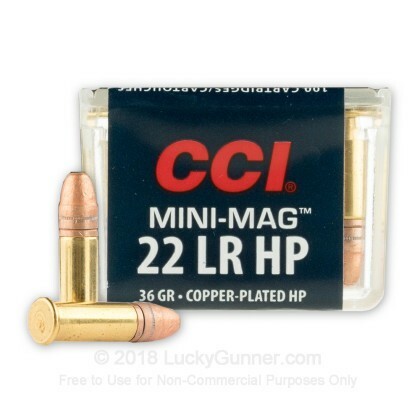 CPHP Mini-Mag rounds by CCI in .22 LR are considered high velocity. They should work good in your Sig 1911. 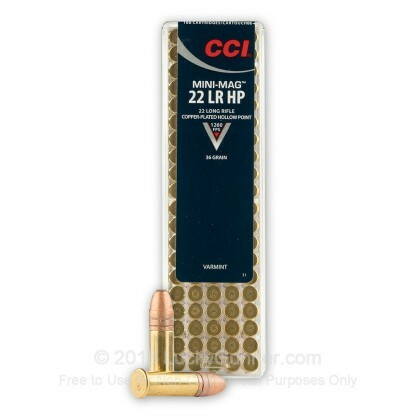 We also have this 22 LR - 36 Grain CPHP - CCI Mini-Mag - 5000 Rounds ammo in stock in a bigger quantity.